Spartan Race – The Biggest Bonza Event Ever! So you think you’re ready to test your fitness in the REAL world? The workouts we do at Bonza are designed with real strength, movement and purpose in mind. They’re not there to make you better at lifting weights, they’re designed to make you better at lifting kids, at excelling in a match of tennis or to prevent you hurting the day after a long ski outing. So it’s only natural that we add a bit of fun to the mix – which is where adventure races come in. Now, we’ve done races like the Warrior Dash (a bit light on the obstacles) and there’s other races out there like the Tough Mudder (if you have a penchant for getting your parts burned by electrical wiring then you’re all over this one). Needless to say, it’s a challenge to find a race that isn’t too simple or too masochistic (I know, I know.. even I have my limits of wanton masochism). Which is why I’m superexcited about the Spartan Race coming up. Distance: Military Sprint distance will be approximately 4 miles give or take a few extra special forces surprises! Obstacles: 15+ Obstacle. Includes monkey bars, ropes, lots of pulling and a few guys at the end trying to knock you over with padded sticks. This Military Sprint will be similar to the Spartan Sprint with additional obstacles designed by the 4th Infantry and Specials Forces units. A big difference is this race has its own rules and rankings which is why it will also have VERY unique Military medals and a different T-shirt. Team: When you register, join team Bonza Bodies Fitness and be part of our wave that runs at 10am! How much: 60 bucks now, but it goes up every month so don’t delay! Special stuff: We’ll get some fun tshirts made up for the event and maybe a bus to drive down together if we get enough people. You gotta sign up soon though! Prices start at 60 bucks and go up every month by 5-8 bucks until it costs $95 to enter last minute. Fair warning, there’s a $12 “health waiver” they’ll make you sign during the process. 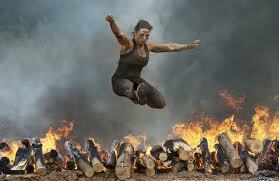 Come do the Spartan Race with us! It’s gonna be BONZA!